Ready to continue our journey to EDUCATE, DEVELOP, and INSPIRE? We welcome all attendees from our AthLife Foundation network schools, college level advisors and educators, and industry professionals eager to engage with the shared goal to create high-impact athlete development programming for deserving kids from across the nation! This year, we are excited to offer an additional full day workshop with Huddle Up to End Gender Violence (Click) led by Director, Jeff O’ Brien, as a pre-conference event on Wednesday, July 13th. 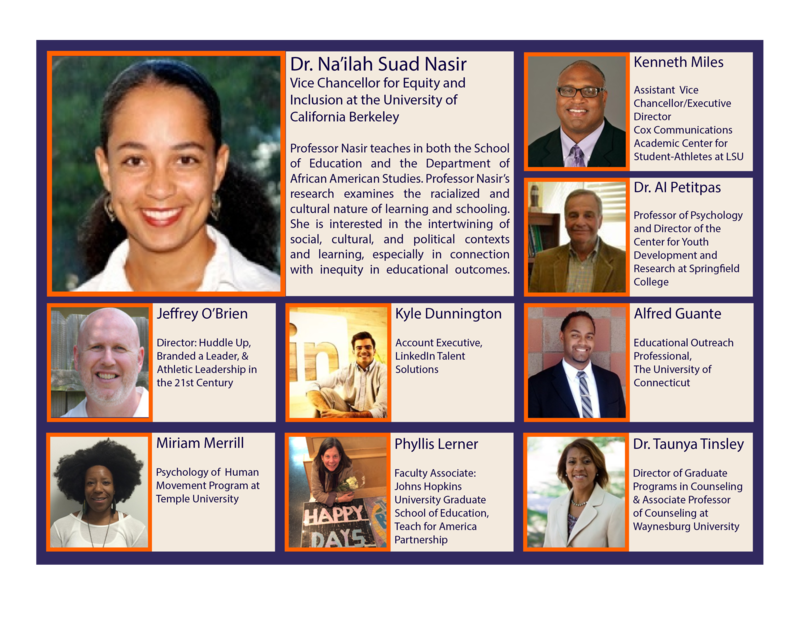 Thursday will feature our Keynote Address with Dr. Na'ilah Suad Nasir, from Cal Berkeley, and our training sessions. You can watch some of Dr. Nasir's work right HERE (Click). Thursday evening will host the Annual AthLife Youth Inspire Awards Program and Reception. We'll hear from incoming N4A President, Kenneth Miles (LSU), on Friday morning. Kyle Dunnington and representatives from LinkedIn will also be on hand to showcase what's new and guide how to best use LinkedIn to benefit our students. Are you ready to "Un-Conference"? Friday afternoon will create an opportunity for all of us to learn from each other, tackle challenges, and develop new strategies to strengthen programs. Things will wrap up Saturday morning by addressing the important topic of concussions and the impact in our world of athletics and education. Please make sure you register and book your hotel room first to lock in the preferred registration rate and current hotel room rate. We would like to thank our 2016 Conference sponsors and supporters below. We are looking forward to hosting you in Philadelphia!